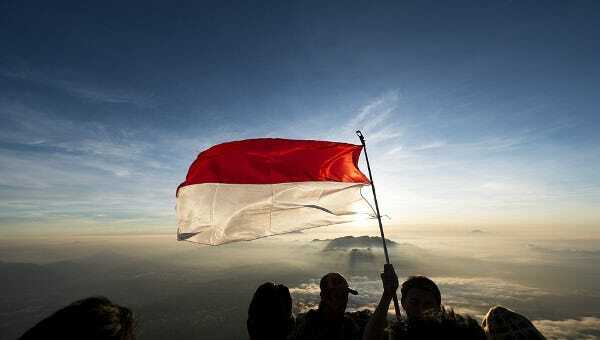 Public figures like politicians, candidates, leaders, nominies etc. 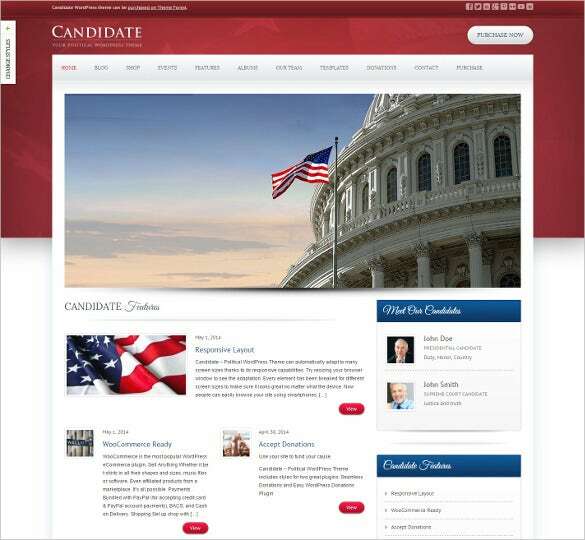 can create their online campaign by designing their website with American Politician WordPress Bootstrap Theme. Parallax video backgrounds, elegant typography, smart animations, full screen images, cross browser compatibility, SEO optimised, social media sharing options, make it all the more popular among the designers. 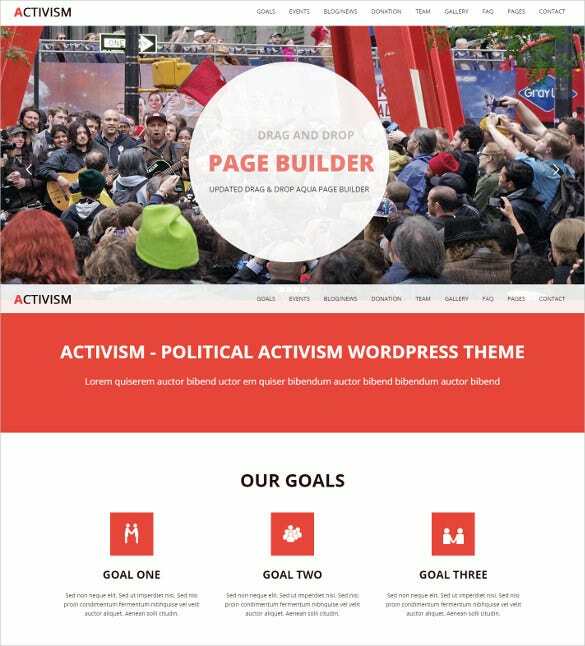 Features like custom widgets, multiple layout options, advanced theme options, colorpickers, popular Contact Form 7 plugin, Google Webfonts, HTML5, CSS3 and PHP code, cross browser compatibility makes Political Press Bootstrap Responsive WordPress Theme one of the favourite for creating political and government agencies’ websites. 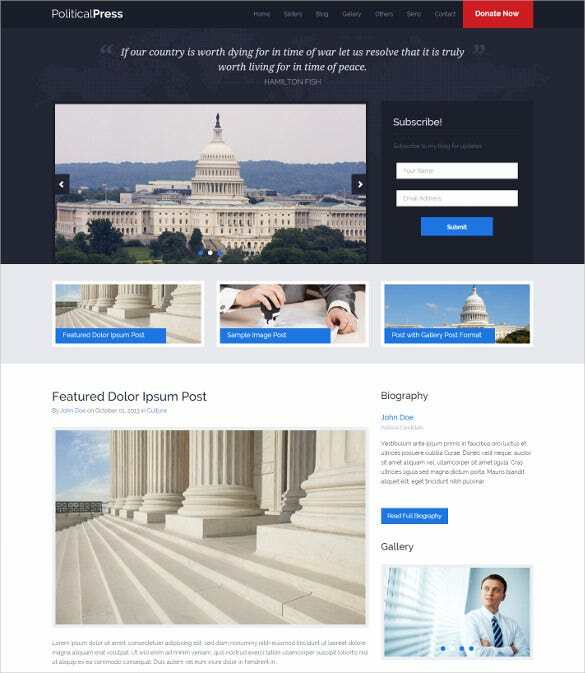 If you are looking for any perfect solution for bloggers, journalists, editors and SEO experts, Government Responsive Political Bootstrap Website Template is one of the most trusted names. 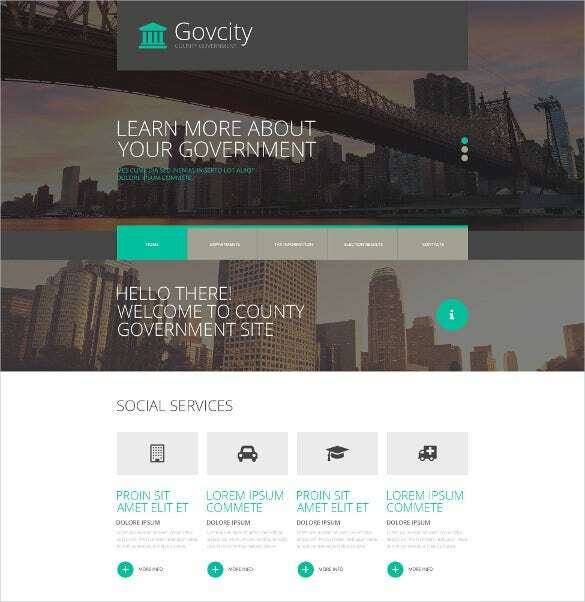 It offer features such as HTML5, CSS3 and PHP coding, fully responsive layout, responsive FlexSlider 2, impressive Google Webfonts, SEO optimized content, social media sharing options etc. 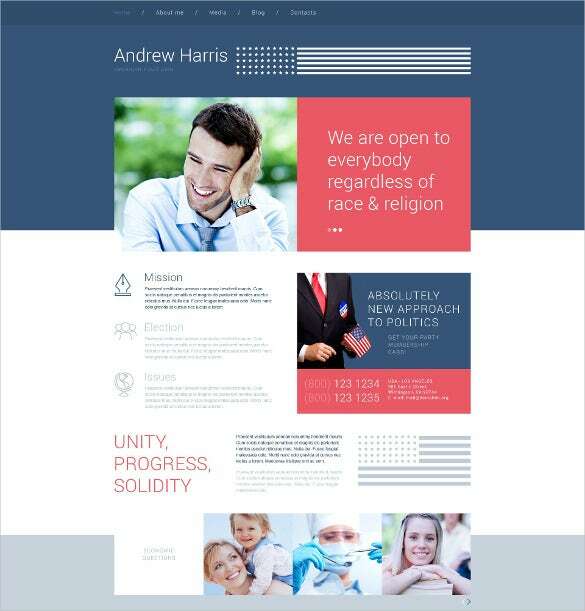 If you’re looking for an apt Bootstrap political theme contender for representing politicos and their campaigns in the online space, we totally recommend you to try the Bootstrap HTML5 Political Template. It is built and designed using HTML5 and CSS coding, enjoys cross browser compatibility, social media options, SEO-optimization, gallery scripts, sliced PSDs etc. 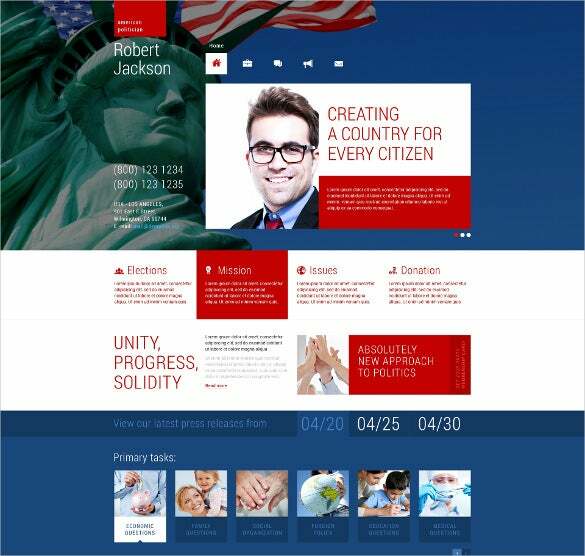 For any well-organized political campaign, the Portfolio for Politicians Joomla Bootstrap Template can help to build a classy website displaying the ideologies of the leaders and political organisations. It is supported by features like HTML and CSS coding along with Bootstrap based framework, plenty of short codes and plug-in for easy customisation, multiple colour and font choice and much more. 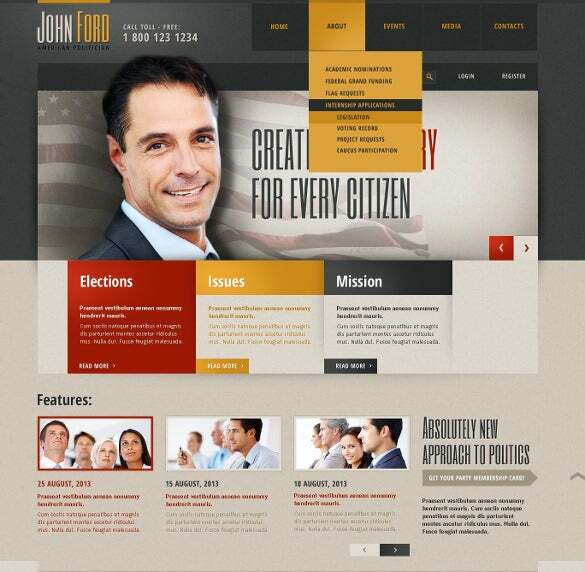 With Political HTML Bootstrap Template, politicians, candidates, leaders can create their own campaigns online. Extensive documented help file for easy setup and customization. Full tech support, layered PSDs, easy customization, HTML5 and CSS3 coding, Bootstrap v3+ Grid System, fully responsive layout, social media integrated options, SEO rich content are the important attributes of these templates. 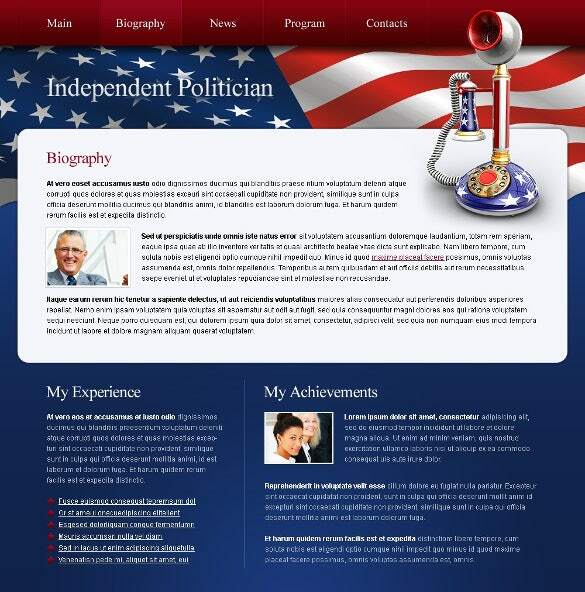 Classic news websites, professional blogs, politicians, candidates etc. 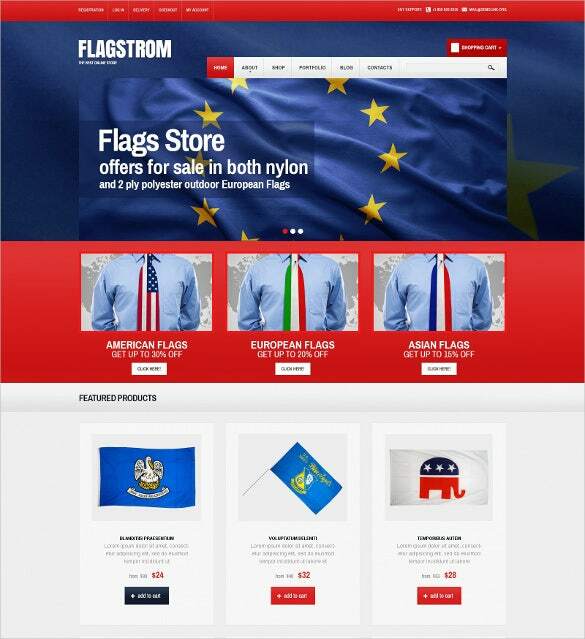 can use Politics Responsive WooCommerce Bootstrap Theme to showcase their new campaigns. Bootstrap v3+ Grid System, HTML5 and CSS3 coding, create submenus, unlimited colour schemes, layered PSDs for easy customization, retina displays, extensive documentation scope, cross browser compatibility, SEO optimised content, social media sharing options etc. are some features. 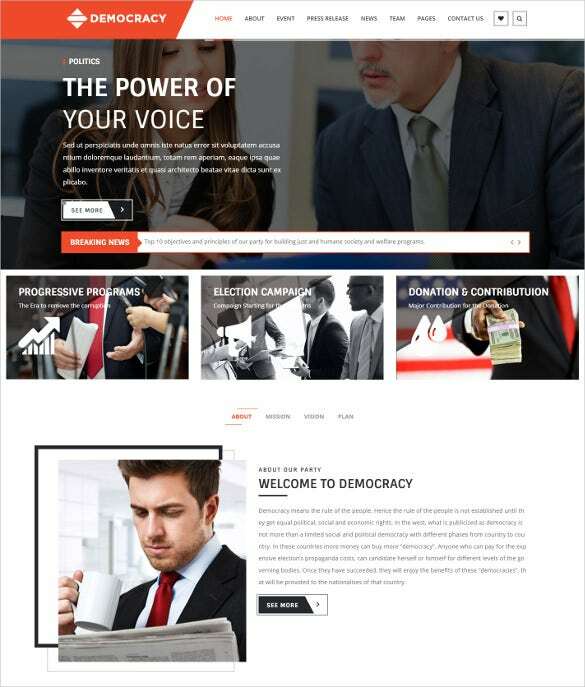 This Democracy HTML5 – CSS3 Bootstrap Political Theme hashtml5 template designed particularly for political and public figures, has features like full screen images, parallax video backgrounds, smart animations, elegant typography, Bootstrap v3+ Grid System, cross browser compatibility. 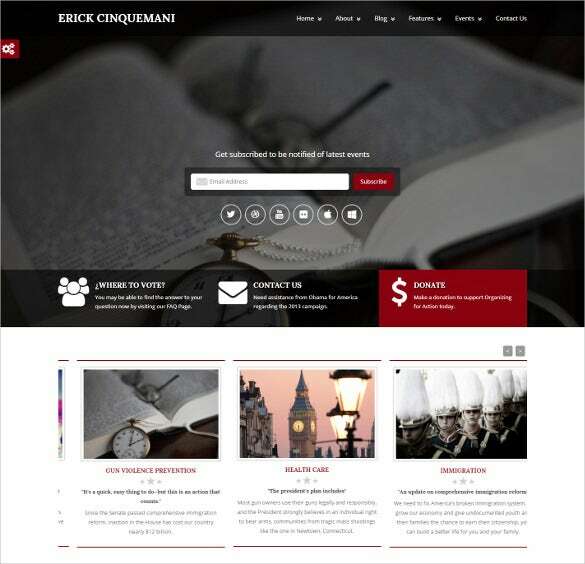 It can be used by anybody such as law firm, lawyer profile, charity, event, campaign etc. 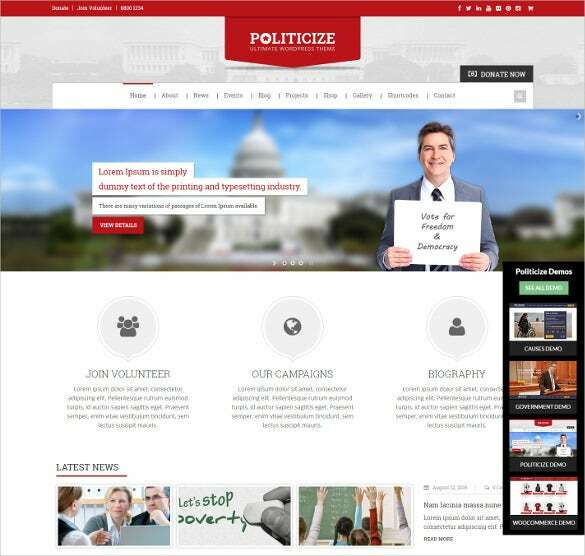 Looking for the perfect solution for bloggers, editors, journalists who want to publish political news? 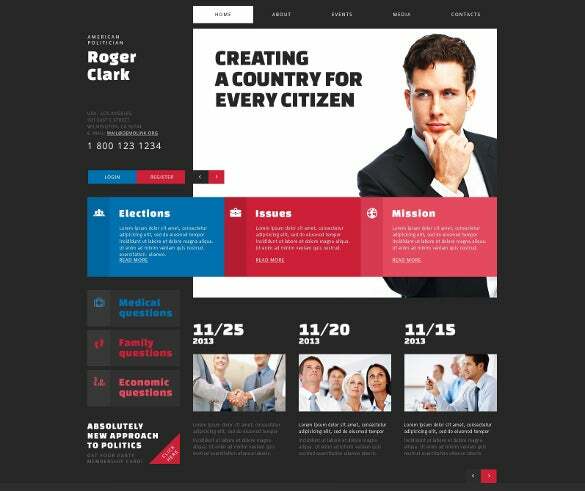 Politics Responsive OpenCart Bootstrap Template can help you create the most maverick designs which come with HTML5, CSS3 and PHP coding, cross browser compatibility, SEO enriched content, social media sharing options, jQuery News Ticker, responsive FlexSlider 2 and much more. 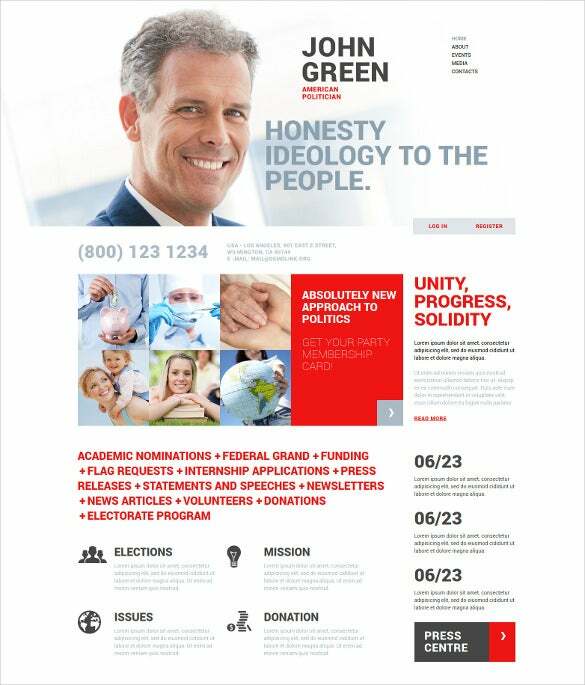 To create all kind of online political magazines, professional blogs, and classic news websites -Free Political Bootstrap Website Template is a trusted name. 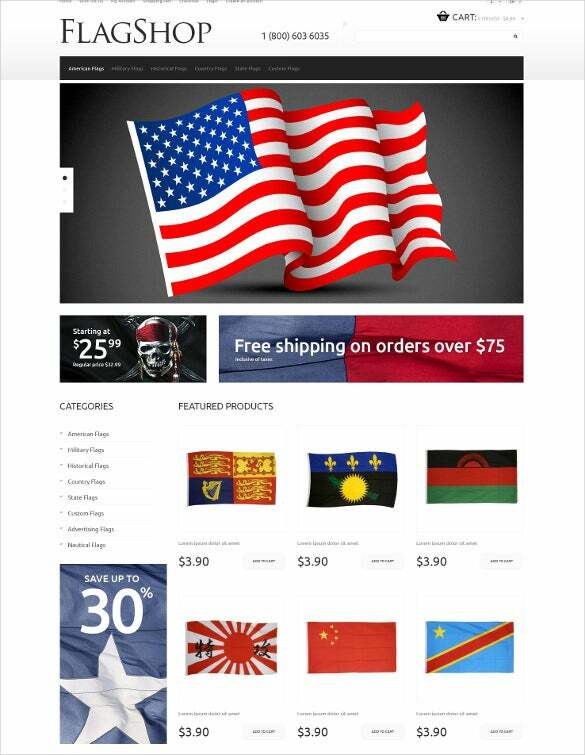 Coded with valid HTML5, CSS3 and PHP code, it also has fully responsive layout, popular responsive FlexSlider 2, popular custom widgets, headers, sliders, and multiple colour and font schemes. 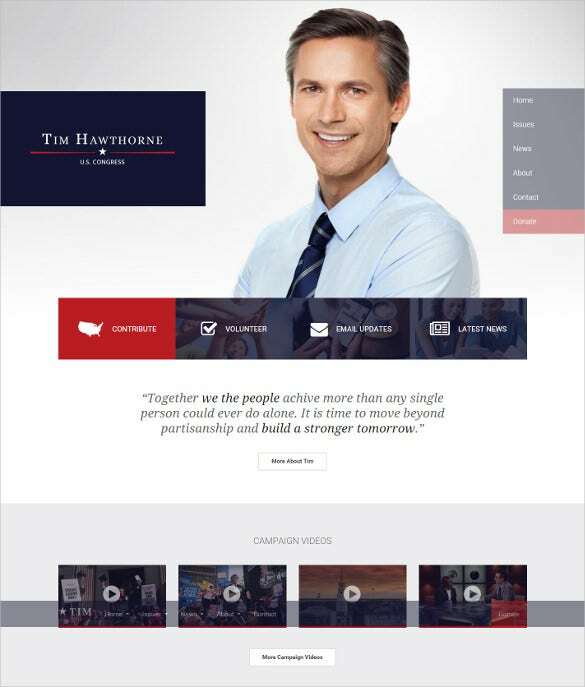 It consists of separate fields for the press release, blog, or forum that is followed by a field to connect with Twitter and Flickr account.With these responsive themes, leave a strong impact on the mind of your voters, volunteers and donors. 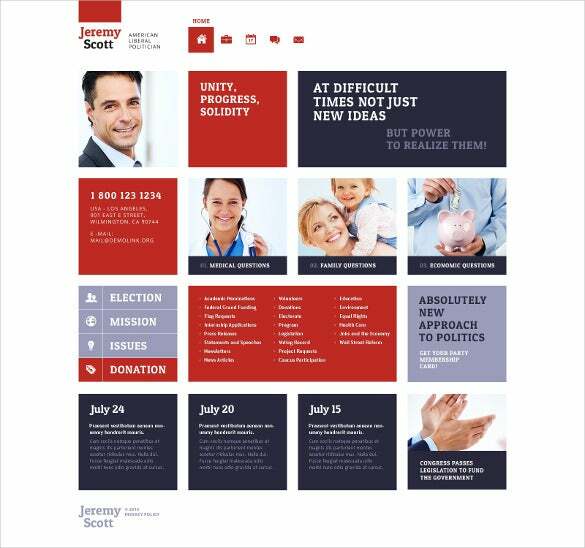 Space on the header of the theme is enough to fit campaign’s logo along with the name of the party and other details.